Disclaimer: This website (Poptropica Help) does not belong to the Poptropica Creators. Poptropica Creators — they’re the team behind every detail of the game we know and love. Every island, every item, every idea, everything. They write up the fun posts with special sneak peeks you see on their Creators’ Blog, make videos for the Creators’ YouTube channel, and lots more. This page is all about those identities – their aliases (Poptropican alter egos) as well as their real life ones. In actuality, Poptropica Creators sometimes switch from identity to identity, but this is just a fun way to present them together. Let’s start with those whose real identities have been matched up to Poptropica alter egos! Captain Crawfish is prominent for being the primary post-writer on the Creators’ Blog, being the voice of the Poptropica video walkthroughs, and more. In the game, he’s the villain of Skullduggery Island. His username is CaptainCrawfishCreator. We know the voice who narrates the aforementioned videos is that of Mitch Krpata from an interview he spoke in. Mitch is Poptropica’s lead writer and has written most of Poptropica’s graphic novels and much more. You can learn more about him and his advice to Poptropicans in this interview conducted by the PHB. Jeff Kinney is the founder of Poptropica. You may also know him as the author of the bestselling children’s book series Diary of a Wimpy Kid (which has some sponsored islands on Poptropica). He also mentions being the founder of Poptropica at the back of his Diary of a Wimpy Kid books. It is not confirmed whether Comic Kid (a retired personality who used to write on the Creators’ Blog) is in fact Jeff’s alter ego, but players have referred to him as such due to his connection with comics. In the game, “Comic Kid” is known as Ned Noodlehead, the comic book store owner on Super Power Island. His Poptropica account is unknown. 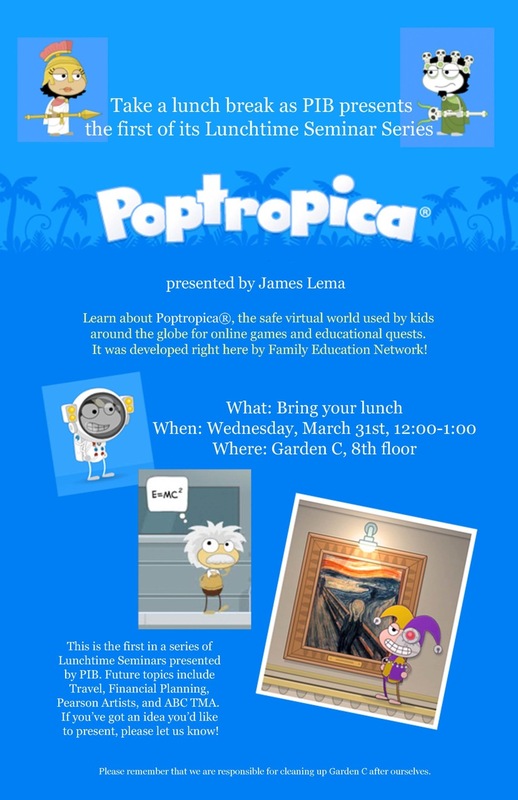 On his Twitter, James has made a few tweets referring to his job at Poptropica, including a selfie of his last day at the office, a goodbye gift from a Poptropica artist named Joel, and a signed shirt that read “Director D-Lema” with Director D’s character on it. Dr. Hare is the alias of Poptropica lead developer Jordan Leary – we know this because his Poptropica username is, simply, JordanLeary. Jordan’s website has an image of Poptropica and describes it as, “This is the big game I’m currently working on.” He has also been quoted in an HJNews.com article about Poptropica. Jordan is the one in the middle of the picture on the right. Also, the developer “Billy Jordan” on Mocktropica Island could be a reference to Jordan. In the game, he is the villain of 24 Carrot Island, and according to Poptropica: The Official Guide, the idea of Dr. Hare was conceived by Shark Boy (presumably Nate Greenwall; see below) when he was in college and was thinking of a nemesis for his comic book protagonist, Carrot Teen (a radioactive carrot). Dr. Lange is presumably the alias of Poptropica game designer (artist) Ashley Lange, based on their names. Her username is not known, and Dr. Lange’s character appears in-game as the scientist on Virus Hunter Island who sends you into Joe’s body. Ashley Lange has a LinkedIn profile professing her Poptropica credentials, and she has also posted some of her own unused Poptropica concept art on deviantArt. On Christmas Eve 2014, the Poptropica Twitter posted an unexpected tribute to the then-current authors of the Poptropica Help Blog (that’s us!) – artwork made by Dr. Lange! Hazmat Hermit is the alias of Justin Lacy – we know this because his Poptropica username is, simply, JustinLacy. Not much is known about him, and although he used to blog on the Creators’ Blog, the identity seems to have since been retired. In the game, he is the guy standing on the meteorite that crashed into the Super Power Island county prison. Master Mime is the alias of Poptropica illustrator and advertising design manager Jon Pitcher, but his Poptropica account is unknown. Jon’s LinkedIn profile used to be a picture of Master Mime, a character modeled after the mimes on Counterfeit Island. On Survival Island (Episode 4), there is a Pitcher item with “Jon” engraved on it – a clever reference to this very person. He also manages the official Poptropica Pinterest page, where the icon is also of Master Mime. Jon’s own Pinterest has a board where he posts Popstorms, a series of Poptropica-inspired sketches. Medusa is the alias of writer Tracey West, who has authored several Poptropica books. One of these is Poptropica: The Official Guide, where it says that Medusa, a character from Mythology Island, is also known as Tracey West. Shark Boy (now known as Shark Guy, thanks to a copyright dispute with a wrestler named Shark Boy) is a long-time Poptropica icon whose identity has now been retired (you can read about the Mystery of Shark Boy here). His username is SharkGuyCreator, though previously it was SharkBoyCreator. He is believed to be the alias of Poptropica illustrator/lead designer Nate Greenwall, whose office looks just like a picture that was once posted by Shark Boy on the Creators’ Blog (the post has since been removed). Nate’s website also confirms his role within Poptropica. Skinny Moon, also known as Jessica Devine, is the alias of the official Poptropica community liaison. As of early 2016, she is the face of Poptropica’s social media accounts, and her username is PopGirlJess. Jessica has announced some spontaneous Multiverse parties with fans over Twitter (read about her first one here) and showed up with her character Skinny Moon, and occasionally visits the PHC (you can find various Q&As with her on the PHB). Triton has never posted on the Creators’ Blog, but his character once appeared on it in a picture showing a Poptropica Creators’ party. It was revealed through a conversation with Chris Barney, a game designer for Poptropica whose projects include Realms, that he used to use Triton’s character to pop in to common rooms every now and then. After Mocktropica Island was released with one of the unnamed basement developer characters modeled after Chris, he took up that identity instead of Triton’s. In the game, Triton appears on the beach of Mythology Island and his username is TritonCreator. Zeus is the alias of Jess M. Brallier, Poptropica’s publisher and the person who runs the Poptropica Twitter (the profile picture is of Zeus), where he frequently connects with Poptropica fans. His Poptropica username is not known, but Zeus appears in-game as the villain of Mythology Island. Jess once met up with renowned Poptropica player Thinknoodles for a chat in New York City, which you can read about here. He has also generously participated in a Q&A with us (the Poptropica Help Network), which you can read the contents of here. These are Poptropican characters who have been recognized as being personas of Creators; however, there is currently no data on who is behind these aliases. Binary Bard used to post on the Creators’ Blog but seems to have since retired. In the game, he’s the villain of Astro-Knights Island, also known as Mordred. His Poptropica username is BinaryBard. Black Widow occasionally posts on the Creators’ Blog, and in the game, she’s the villain of Counterfeit Island. You can also add her at the username BlackWidowCreator. In the past, her identity was speculated to be Jennifer Wood, due to her high-ranking title (managing editor, senior project manager) at Poptropica, according to her LinkedIn profile. Her being female and her skills in copy editing (writing) made her a likely candidate for the alias of Black Widow. However, a conversation with Chris Barney (Triton; see above) revealed that while he could not reveal Black Widow’s true identity for privacy reasons, it was not Jennifer. Gamer Guy (not pictured) briefly posted on the Creators’ Blog as an “intern”, as a joke to promote Mocktropica Island around the time of its release. His username is unknown, but he is represented in-game by Abe, the gamer on Zomberry Island. James Lema’s shirt tweet includes a signature from “Abe”, who may be represented by Gamer Guy. There is also someone named Abe (Abraham Tena) who has worked as a Poptropica game designer, and you can view his portfolio (which contains Poptropica art) on his website. Hades used to post on the Creators’ Blog, and his username is HadesCreator1. His identity was once taken up by Mitch Krpata, as we can see from this posting by him on a “Poptropica Assets” page which has a Bolas Plant SWF which was posted by Hades on the Creators’ Blog. However, Mitch is now more prominently known as Captain Crawfish (see above). Red Lightning (not pictured) was briefly mentioned in a Creators’ Blog post as one of the Creators whose dog, Rubbles, played in the snow with a Dr. Hare plush toy one February day in 2017. Thirsty Whale used to post on the Creators’ Blog but seems to have since retired. In the game, he’s Edmund Hilary, the first guy to reach the summit of Mt. Everest on Time Tangled Island. His name is possible to get when signing up, but you can find him on Poptropica as ThirstyWhaleCreator. Vlad the Viking (not pictured) used to post on the Creators’ Blog but seems to have since retired. His name is also the username of the old Poptropica YouTube channel. In the game, he’s one of the Vikings on Time Tangled Island. Hi i love poptropica! But when ever i log in my accout and then go to the Diary of a wimpy kid ad, I can’t go in. I have waited for an hour and it didn’t even work. Please help me. Is this a bug? I tryed that allot. It finnaly worked after 5 hours. I had to go somewhere….. These are all the ones I know! My user name is green_gem if anyone knows dr.hare’s user plz tell!!!! These usernames and more are listed on this page and our PHB Friend Finder. Dr. Hare’s username is jordanleary. It would say comic kid as his name but it doesnt say that. I meant for the friends section it would say Comic Kid. They aren’t the creators, they’re only fans like us. These are not the creators. For posts from the creators, go to the creator’s blog, not phb. I want super Villian island! I’m back! I haven’t been here for over 2 years! I have proof that fact monsters name is dummy1063.If you type that username in avatar studio the name says fact monster.Plus it doesnt have to say fact monster because if fact monster wants his username dummy he can have his username dummy.It really doesnt matter.So now lets just say its dummy1063. If you look at the cyborg eye it shows it is light green that must be what they planned ALSO IF some1 has already said this I DID NOT TRY TO PISS THEM OFF Because I was just looking around and found it also can you check out this post! Link: http://blog.poptropica.com/2009/04/rest-in-peace-help-blog.html . Is this YOUR BLOG there talking about? Reply please! I think THE FACT MONSTER pick is wrong its a pic of diamond caves THAT IS A MULTIVERSE ROOM only creators would be in there BECAUSE IT MIGHT be the sources account WICH I BELIEVE IS dummy1036 so I WOULD DELETE it if I was an owner of this blog! PLZ read it Slanted and DELETE the pic! If you need proof he would need to know a code! Yes, the picture was taken in a Multiverse room. That could mean a Creator visited because he would know of an open code at the time, so it might be the real Fact Monster. We do not know if dummy1063 is in fact the real FM’s username, since the username itself seems to suggest it is a clone. But still to think they would look at your room codes thats wrong! and If they do then I don’t have a point but IF THEY DON’T I can prove because if see some posts they did they showed some sort of party in common rooms and well they are like right next to eachother so I believe its fake because I didn’t see any NORMAL poptropican enter! WEIRD and so are the other not noticing no offense! look you carn’t talk me out! just get another photo (or no photo) the only way you can get a real photo is of dummy1036 in friends list because atleast people will believe it because you won’t include the username! I didn’t say he got an email of the code. I’m not sure I understand you entirely, so please, calm down. I took the picture myself three years ago, and the person next to Fact Monster is me (a “normal Poptropican), so no, it isn’t faked. The Multiverse was a mini-party we were having on the PHB chatroom (the PHC), so anyone there could know the code, and I’d written this PHB post about the possibility of someone there being FM. However, we don’t know for sure. This was long before the days of “Poptropica friends,” and besides, you can’t find out someone’s username by just adding them in a multiplayer room. Also, the Creators have been known to visit open Multiverse rooms (for example, Dr Hare), so it is possible that they are able to access the codes, even if we don’t know for sure. Note that the username is dummy1063, not 36. I did include this username on the page but have mentioned that due to the nature of the username itself, it sounds like someone’s clone account since the other Creators have usernames that actually relate to them (eg. Hazmat Hermit’s is justinlacy because his real name is Justin Lacy, and Shark Boy’s is sharkboycreator). edit:-MULTIVERSE- rooms and well they are like right next to eachother so I believe its fake because I didn’t see any NORMAL poptropican enter! Oh and guys if you want some cool costumes I’m a member add me I’m JamesKiro I am usually on everyday but ever since I completed every iland I’m less active! I don’t go into common rooms because people flock me with chats battles and MY LEAST FAVOURITE friend EUGH! how do you get the fact monster costume, the fire knight, the ice knight, bianary bard, hades beard, robot , dr hare, and captian crawfish? Here is the link to the person named Red Dragon! ALSO what IF THERE was no such thing as fact monster as a creator! because he never posted he may of worked but it may just be a rumor turned reality through hacking? Fact Monster doesn’t post on the Creators’ Blog, but the website Fact Monster is developed by the same person who helped develop Poptropica – Jess M. Brallier. Fact Monster (the website) is also a sponsor of Poptropica. ok so I have a point! Time Twisted was Time Tangled’s name before the island was released. They’re the same thing. FactMonster.com is an educational website developed by Jess M. Brallier, who also had a part in Funbrain and Poptropica. Fact Monster’s appearance is based on the mascot for the Fact Monster website, which you can search up if you need proof. Jess Brallier’s name appears in some press articles about Poptropica as a representative, so it’s safe to say that he does work at Poptropica. Dr. Hare’s username is jordanleary, after Jordan Leary, a Poptropica Creator. As for some of the more recent discoveries, such as Captain Crawfish’s, we don’t have any information on his real name/identity and he chose not to identify it with his username, which is just captaincrawfishcreator. Just because the username goes with the alias doesn’t mean they’re not a Creator, for example directordcreator1 (Director D) is James Lema, as written on the database above. It’s so strange that ON PENCIL WARRIOR it has the Time Twisted medallion! And that, my friends, is why I call Time Tangled Time Twisted. Oh, and before they called it Time Twisted or Time Tangled, It was called Time Lapse. My Dad told me he thought Captain Crawfish was in charge of the blog, since he lives in the Phillipines. Time Lapse Island? Was this during the making of the island? I only remember it being Time Tangled… but it’s very possible. It was released as Time Tangled, but while it was in production, it was known as Time Twisted, and before that – Time Lapse (according to my research). A search of “Poptropica Time Lapse Island” can show some evidence of this, such as on this blog post by a long-time Poptropica player called Legoless. I don’t care plz it may be real or fake but MY BIG QUESTION is is it the real fmonster it may of been a person who knew about it but still I guess he could of checked the blog! Btw I know tt and timetangled is the same!Still there kinda like stalkers watching us! LOL! I get you know it was 10 oclock when I posted some of my arguments so I must of been asleep! When is your next anniversary of PHB going to be because I wanna join in if you wanna know my name its Cuddly Bear >:O 😦 :O I forgot to change it because I thought my guy looked good but he had BAD NAME! I want NAME HACK!!!!!!!!!!!! I believe you now Slanted Fish thankyou! I also think I know why James Lema is sooooooo very unactive HE MIGHT BE THE ONE WHO DELETED MONSTER CARNIVAL He and maybe thirsty whale helped as kitty said OR IT might be the other way around Dr.D helped Thirsty Whale! Director D made a post 1-2 months ago……. Well I can’t confirm for sure whether or not the “Fact Monster” in the picture was the real one or not, since you can’t find out someone’s username just by seeing them in a multiplayer room (this was also before the friends feature was introduced). Still, there’s a chance he is real. Is Fact Monster from Monster Carnival? I think the user, Fact Monster, was made because of Time Tangled Island where it features some of his facts. Thankyou so much slanted fish I understand now, I also knew time tangled and time twisted is the same! btw it was 3 m ago and I’m sure its not him because he never posted for ages or maybe he was to busy but still managing digital design still would still kinda have spots to do some posting! How do you like my new Picture LOL! I did it yesterday I think it is NEAT! I hope you enjoy being a friend of a luxurius person JK JK LOL LOOOL! @slanted Fish What is your user I would like to friend you?! I hear you have helped Fuzzy-B’s blog in the past from some bad people who threatened and sweared in his blog! Your AWESOME! I just hope EVERY1 has a spoooooky Halloween and hope you all ejoy my costumes on the post from Slanted Fish! My username on Poptropica is hi.Juyo, and you can find some more usernames on the PHB Friend Finder. I’m not sure what you’re talking about for Fuzzy-B’s blog, though. Hi Slanted Fish! Me again! I need you to answer a question for me. Can you see the creator’s characters in the multiplayer rooms? Slanted Fish: It’s probably rare, but if they choose to go in (and they have), then sure. Slanted fish! Remember me! I asked you that question about Medusa’s username! Slanted Fish: You can try any of them, though they may not respond. You can also try the Contact link on Poptropica’s homepage. Somehow, I don’t believe you’re sixteen. First, the lack of punctuation. Second, I believe that you are maybe 13, to 14. I’m only 10, so I can’t really relate. But, I know for sure I’m majoring in Creative Writing. Cheers, you sound like a nice guy. Please friend me, at iopiopiopiop8. I am not a girl, that is a glitch. One of the coolest costumes you will ever see. YES I HAVE 70 FRIENDS!!!! BTW I’m trying to print the binary bard pic. So funny! It is.It can be read on Funbrain.com . Pingback: New Poptropica Books for 2013 – Poptropica Help Blog - news, walkthroughs, cheats, and more! I have a theory of who Binary Bard is…he is probably someone in the blog who is an expert on binary coding. Slanted Fish: Jeff Kinney is not the username; it’s an actual person’s name. Does anyone else notice that at the end of Binary Bards posts theres the number 01010101010? For Mr. Riordan saying that he works on Poptropica, he could be lying. However, I must stress the word “could”. ok i think i know ned noodlehead’s username, ( possibly jeff kinneys) the username is nednoodleheadcreator and i think it is him because the only thing customizible is his hair nothing else, not even his smile. I like to think of myself as a poptropica creator on somedays. I contacted them saying that i would be a great creator! i hope they make me one. P.S. if they did i’d make Slanted fish a creator. OMG do you think that there’s some glitch to do that? That would be really awesome. i would use it all the time! Hazmat Hermit is in Nightcrawlers and Shark Boy is also in Flying Squid. Director D is currently chewing gum. Who do you like best? Black Widow or Captain Crawfish? Please Reply with your answer! you know what the creators should create actually?? a poptropica app for like ipods and iphones and stuff. like, i really wanna get the ds game poptropica adventures but it’s like thirty bucks. and an app would be so much easier to get, people won’t need to go to a store to buy it, they just use app store on their devices…(particularly apple cuz that’s what i use). and also there is a decreasing amount of people using nintendo and an increasing amount of people using ipods or phones or ipads or tablets or whatever. I WANNA TAKE POPTROPICA WITH ME EVERYWHERE!!!! Slanted Fish: Poptropica has guide apps for mobile devices, which is the closest thing for now. i have a tablet. it’s a Nabi 2 and i hate it. i’m actually glad that the charger broke. P.S. just in case you’re wondering, i’m using my mom’s computer right now. how do you get poseidon’s moustache i have a friend who has it and i really want it or zeus’s lighning staff not the one in the store his master bolt the onre he holds or hades beard i have friends who each have these things pls help!!!!!!!!!!!!!!!!!!!!!!!!!!!! thirstycatfish i will friend you will you friend me? i’m Awesome80885, Awesome80884, HamishPomPom, caoimhecrazy and lalalarere. Good idea, I’ll write to the big guys!!! I have a poptropica account but it keeps refreashing each time i try to log-in. many of my friends have that same problem anyone have a suggestion. My user is charmander923. I have a bunch of stuff from Binary Bard(face,eye,pants,suit), Captain crawfish(hat), and Dr.Hare(belt and tail). 4 words for jeff kenniy: WHAT. IS. YOUR. USERNAME. Slanted Fish: If his name isn’t “Master Mime”, it wouldn’t be him. On Jennifer Woods Linkedin it says that the people part of poptropica are Jennifer Wood, Dan Franklin, Christopher Barney, Billy Belfield, Chris Messner, Jordan Leary, Ashley Lange, Karl DeBisschop, Mitch Krpata, & Lance Fry. Do you know who those people are Slanted Fish? Slanted Fish: Yes, some of these people are listed here as Creators. Also do you know who Lisa Wolfe is? I was thinking of doing a poptropica blog. Do you have to ask for permission from the creators? If so, who should I ask? I had just finished survival island episode 1 and it took me to the 2nd episode. I saw pages and tried to click them but nothing happened. Then I went farther and rocks started rolling at me, I went along with it for a while, but then decided I should check the walkthrough. I realized this wasn’t exactly normal for most players so I walked around the little bit of island I could actually walk on, and on the tree where you should of engraved your/ my name, read “Creator Steve was here”. What should I do? Slanted Fish: Sounds like a glitch – try logging out and then back in again, play on a different web browser, and/or change computers. If I have a question about what I find on the Creator’s Blog, is this the place to ask about it? There’s a developer missing from this list. His name is Gabriel Jensen, and his username used to be “pizmogames”. May you please check if the real Master Mime username is Master_Mime. I am asking because it is a girl that looks like a mime and it says Master Mime.